The dual-sided multipurpose EnviroSponge quickly wipes up spills and stubborn sticky messes without scratching. 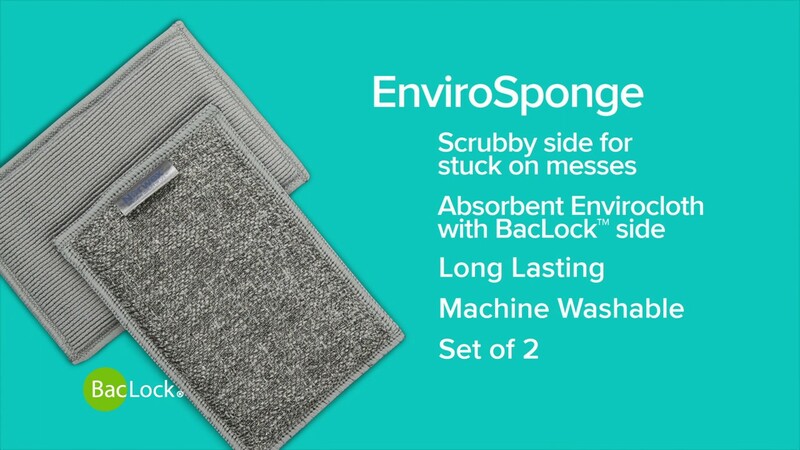 Features BacLock on one side and special scrubby microfibre on the other allows cleaning of kitchen messes without harmful chemicals. Repeated use saves money and the environment. Where to use: Ideal for use in the kitchen or bathroom to remove burnt-on spills, dried-on residue, sticky spills, soap scum, mould and mildew stains etc. Warning: When using on easily scratched surfaces such as brushed stainless steel, first test on an inconspicuous spot. Do not use on anti-glare surfaces. Maintenance: Between uses, squeeze or wring out excess moisture and allow to air dry. Slightly dirty EnviroSponges can be washed with Norwex Dishwashing Liquid under warm running water and used again before laundering. EnviroSponges that have been used heavily should be laundered using Norwex Ultra Power Plus which contains no fillers. You can buy the Norwex Envirosponge online from me, in Australia. Or you can buy it in New Zealand here. If you are elsewhere, check Norwex.com to find a consultant in your country. Seriously love those things! After trying them once, I’ll never go back to the crap that I was previously using (ie: Random things that didn’t work well).